National monument, Kuala Lumpur, Malaysia. Foto: Anders Thorsell. The huge tall bronze figures of soldiers standing and supporting their fallen comrades, which is opposite Lake Gardens, are the work of sculptor Felix de Weldon, who also did Washington’s Iwo Jima Monument and it is regarded as the largest bronze monument grouping in the world. 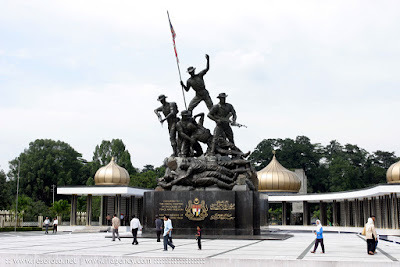 The National Monument was completed and officially opened on February 8, 1966, by the Yang di-Pertuan Agong. It was proclaimed a memorial park dedicated to the 11,000 people who died during the 12-year Malayan Emergency (1948-1960). Thereafter, a wreath-laying ceremony takes place at the monument every July 31 on Warriors Day. On 27 August 1975, the monument suffered extensive damage due to an explosion set off by a communist terrorist. But the communist had denied their involvement and instead alleged it was the work of the government itself to damage the monument in order to rationalize the rebuilding of the monument statues which was perceived of having statues of the Caucasians to resemble the looks of Malaysians to avoid being alleged racist and any embarrassment on the government part by blaming the communist. It has since been restored to its original state with the new looks on 11 May 1977. A fence was then erected and the complex was declared a protected area between sunset and dawn. Every day at dawn, a soldier raises the national flag and lowers it at dusk. May the blessing of Allah be upon them. The monument depicts a group of soldiers holding the Malaysian national flag, the Jalur Gemilang, aloft. Each of the bronze figures symbolizes leadership, suffering, unity, vigilance, strength, courage and sacrifice.